Let me start by saying, if you haven’t read the first book in this series, I urge you to give it a try. It’s called Shaman, Healer, Heretic. Scoot! Go buy it now. This is book three, and while you could probably pick up on what’s happening, you’re better off starting from the beginning. And I really think you’ll enjoy it. This installment picks up just days after the last one left off. Olivia has ventured out on her own after finding out she can’t have a relationship with the man she loves. 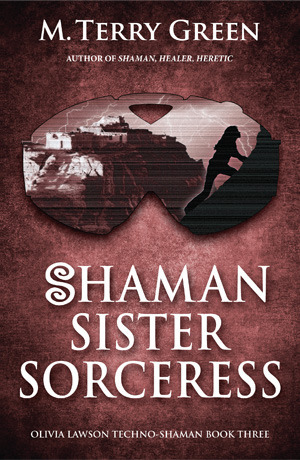 She doesn’t know where she’s going, but something compels her to visit a Hopi community where something nefarious is underfoot. The place is ripe with other shamans –and they are all interested in Livvie. Quickly, she is pulled into their internal battle over some missing tablets and plot to remake the world. She doesn’t want to be part of it. But one of those tablets could hold the key to a possible future with SK. Plus, Livvie is an honorable woman. She can’t turn her back on people who really need her. As with the first two books, the writing and the story here are well crafted. I like Livvie and I really feel like I know her at this point. We’re introduced to a wealth of new secondary characters, and I struggled a little with that in the beginning. But it did not take me very long to get to know them all and see their evolving places in the story. The action is good –and the plot is unpredictable without being unwieldy. The book did have a slightly different feel than its predecessors, I think. We’ve abandoned the city and its cast of characters in favor of the Hopi and their different culture. It took me a little longer to connect to the story. Maybe it was just because I missed SK. Certainly, once he showed up, I felt much more connected. And speaking of SK… this wall between him and Livvie needs to come down. I know these aren’t romance novels, but let’s cut these two a break! I really want to see them make a go of it. I wish there had been a little more movement in that part of the story. All that being said, I thought the book was good and I read the whole thing in one sitting. It’s self published, but you would never know that unless someone told you. It’s high quality… and I am thrilled that the covers have a new look. I hope that will prompt new readers to give them a try. Now, the wait begins for book four…. When my schedule clears up a bit, I’m going to need to grab this one! I really liked the first two books, and I adore SK!